20 Christmas Printables that are sure to make your season merry and bright! Download 20 of the best Christmas Printables out there from holiday cards, to present tags and even activities to get your kids involved and busy. All these printables are free and easy to do. Just download the PDF file, hook up your printer and go! I love free printables, they are a great way to add such a personal touch to the gifts you hand out. These awesome freebies that are ready for you to download, print and use for the holidays. I have some fun gift tags, cards, and activities to keep your kids busy on those cold and dreary snow days! Santa Gift Tag| Thrifty Jinxy: Gift tag from Santa showing you made the “nice” list and have a gift that you get to open Christmas morning. Penguin Gift Tag| Thrifty Mama Life: Absolutely adorable penguin gift tags. These are great to add to your kid’s gifts, they will love the adorable penguin. Christmas Blackboard Gift Tags| Akamatra: These tags look like a chalkboard with white chalk writing. They are absolutely stunning, and would really dress up any gift. Modern Gift Tags| Tater Tots and Jello: Think black and white and all things glitter when it comes to these stunning gift tags. Red Barn Gift Tag| Refresh Restyle: Add this country chic red barn gift tag to all your holiday gifts this season. A very classy tag, that is unique. Rustic Holiday Card| Life in Left Field: These red and black plaid rustic holiday cards are gorgeous. Send well wishes to loved ones this holiday season with your custom cards. Mini Santa Holiday Card| Thrifty Jinxy: A small card that is great to hand out with a candy cane or sweet treat to friends or even let your kids give to their classmates as a happy holiday gift. Ugly Sweater Gift Tag| Oh My Creative: Hosting an ugly sweater party this holiday season? This might be the perfect tag for you! The Grinch Handprint Card| You’re a mean one, Mr. Grinch. Use your kid’s handprint to make the Grinch and then print out the card template, for a cust holiday card! Geometric Gift Tags| Simple As That Blog: Love the color scheme and the geometrical shapes paired with the eye-catching fonts. These will really dress up any holiday gift. 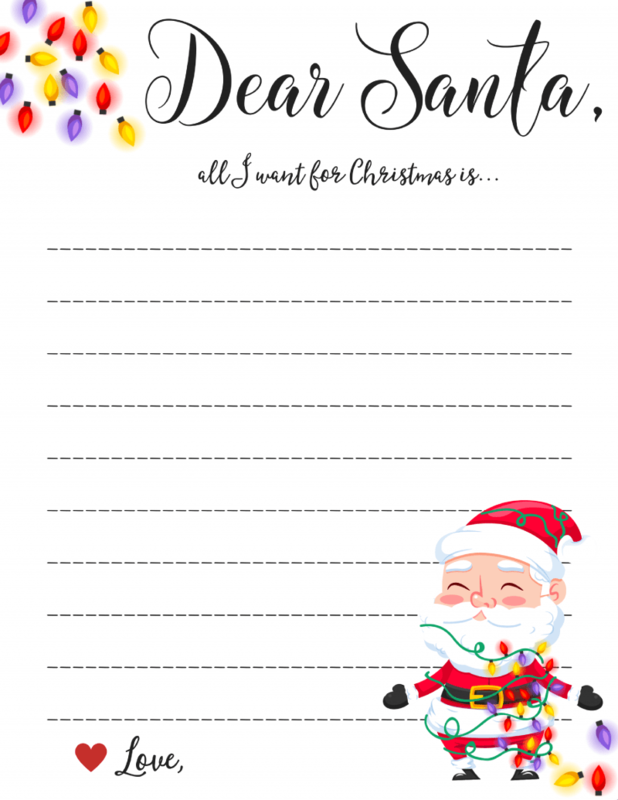 Dear Santa Template | MomDot: Write Santa a letter and download one of these super cute Dear Santa Templates. There is also a second set of creative letters for Santa here. Christmas Bingo| Sunshine and Hurricanes: Grab some holiday colored candies and let your kids use those to place in the boxes to create a Bingo on Christmas items. Christmas Light Scavenger Hunt| Retro Housewife Goes Green: Pair up in teams and go out and look for items around your neighborhood and then meet back to see who found all the items first. It is a fun way to spend an evening with the whole family. Dress up a Snowman | MomDot : 6 sheet coloring sheets for Snowman building. Easy to decorate sheets for kids! Christmas Word Search| Sunshine and Hurricanes: Let your kids search for Christmas inspired words like a sled, Santa, tree, and more. Perfect activity for a snow day. Christmas Coloring Pages| Easy Peasy Fun: Nothing beats a holiday-inspired coloring page! Print off some coloring pages for you and your children to spend the day. Christmas Morning Scavenger Hunt| Mom on The Side: On Christmas morning set up a scavenger hunt for your kids to go on the hunt for some sweet treats. A fun way to spend some time before you open presents. Christmas I Spy Game| Simple Play Ideas: Great for younger kids to try and search out all the gingerbread or snowmen they see. A fun activity that is Christmas inspired. 25 Days of Activities Calendar| Sippy Cup Mom: Countdown to Christmas in a fun way with this activities calendar. Each day provides a new and fun activity to do as a family. From baking gingerbread, decorating a wreath, and more. Activity Placemat| Real Life At Home: If you are having a bunch of kids over for a party or family gathering, print off these activity placemats. Set out some crayons and let the kids have fun doing Christmas activities while they wait to eat. Printable Christmas Puppets| Easy Peasy Fun: Your kids will have hours of endless fun with these free printable puppets. Santa Claus, elf, and a reindeer. Christmas Game Printable| Making of a Mom: Print off this Christmas game pack, crosswords, a maze and more. Great for a cold winter day to stay in and do fun activities. 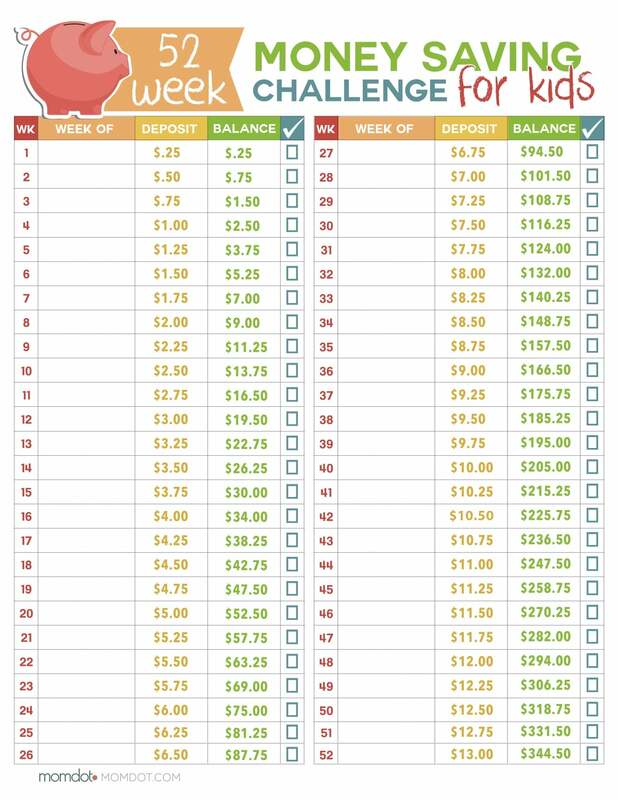 52 week Money Saving Challenge for Kids – This free printable will help kids in small increments save throughout the new year. Click below to be taken to and learn more about this valuable new years way to learn while you earn. « 15 Easy Elf on the Shelf Ideas You Will Love!